How did I become Mama Duck? Earlier this summer we and our neighbors decided to raise some Rouen ducks for our pond (known in Texas as a “stock tank” or just “tank”.) 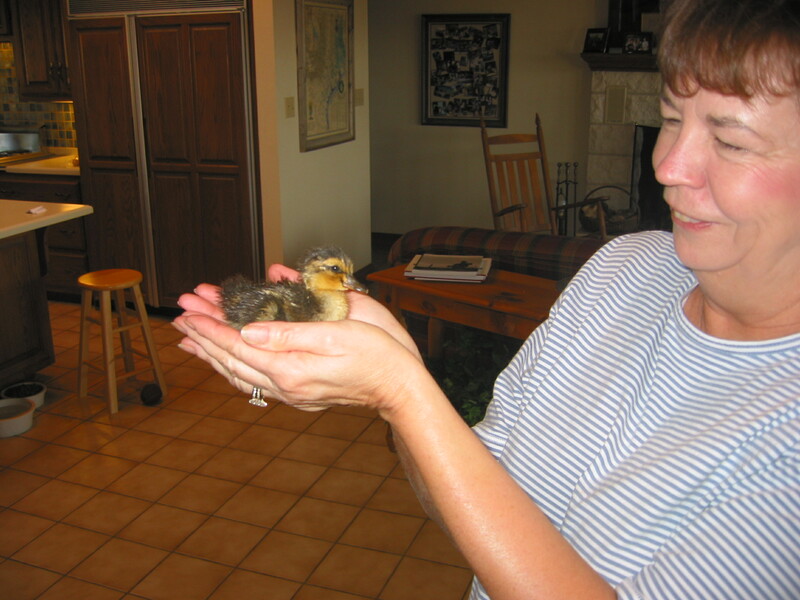 We have raised ducks before—five or six years ago– but they have all disappeared through old age or predators and we decided we would enjoy them again. The ducks are ordered from a breeder and come via mail at one day old. The post office calls first thing in the morning…and I mean first thing, usually about 6:00 a.m….that there is a cheeping box of birds to be picked up AS SOON AS POSSIBLE. 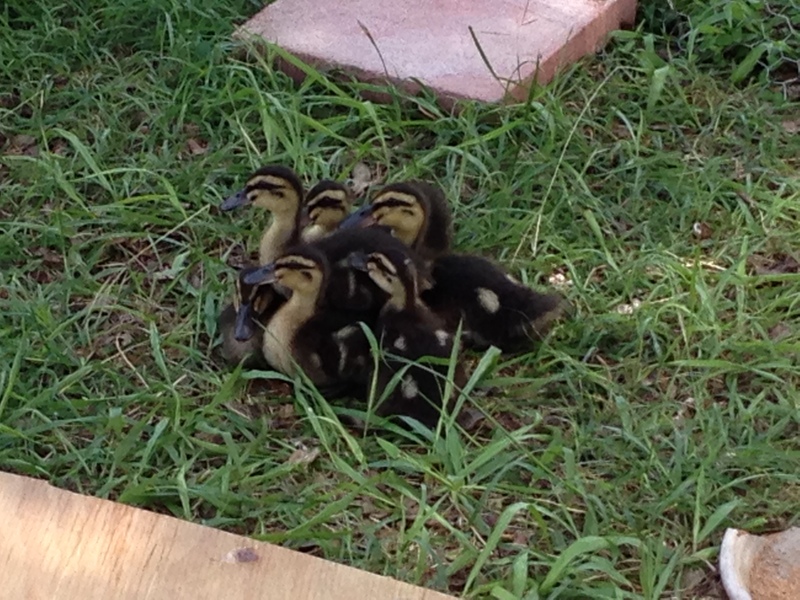 Our ducks, six cheeping handsful of down, lived for the first week in the laundry room in a large cardboard box. They had a heat lamp to keep them warm and we lined the box with newspaper to keep them semi-clean They are messy, smelly little things; the box needed to be cleaned daily, lined with fresh newspaper and food and water dishes refilled. Ducks like water. They really saw their water dish as a small swimming pool. Every morning about 4:30 they would begin cheeping for fresh water and food. Tom was the one who heard these early morning protestations and got up to fulfill their requests. Enough of that. The second week we moved them out to the shop and into an old poultry cage we had before used for our birds. Out of earshot and smell range (not to mention they were quickly outgrowing the box) we slept a little better. We built a nice round chicken wire pen inside the fenced garden and filled a small wading pool for their swimming enjoyment. 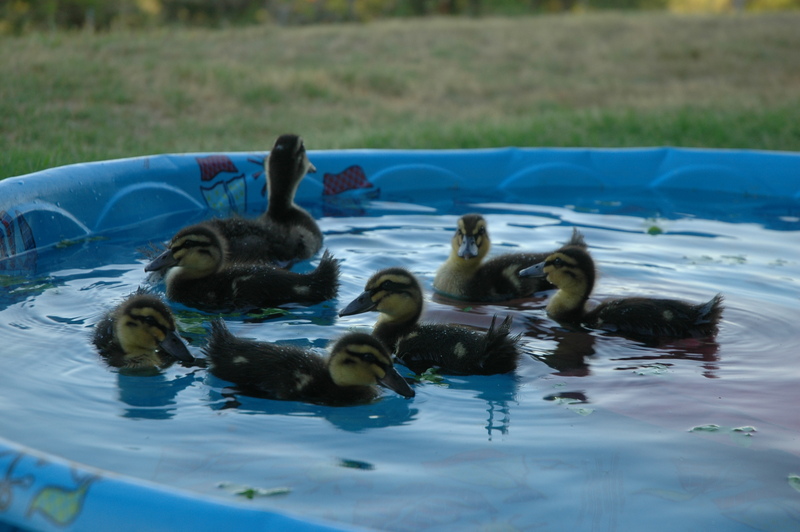 Although they were growing fast, we had to build “duck ramps” for them to be able to get into the water and we placed a rock “island” in the middle of the pool for them to rest on. Every morning we gathered the ducks into a cardboard box and transported them to the outdoor pen. In the evening we rounded up the ducklings, after chasing them around the outdoor pen and putting them in the box to transport back to the poultry cage. (Making the outdoor pen round was not a good idea – no corners to catch them in.) They are very fast little devils! I would “quack, quack” to reassure them that it was Mama Duck, and hopefully convince them to follow me. After the second week the ducks had outgrown the small wading pool, so we added a larger one and took down the chicken wire pen. They now have full roaming rights to the entire garden area. By the end of that week, they had the morning and evening routine down. We no longer have to transport them in a box between the garden and their night-time pen. Open the door to the shop and the cage door in the morning and I could lead the ducks out to the garden, quacking as we went. Tom says I flapped my wings, too, but I deny it. After a few days I didn’t even have to do much as far as leading or herding. Now when we open the door to the poultry pen, out they march, in a close group, on their own. About sundown we reverse the routine, usually following behind the ducks, as they seem to know it’s time for bed. They head straight into the shop and the evening safety of the poultry pen. A few nights ago, I was a bit late going out to bed them down and found they had already taken themselves inside for the night! As the ducks grow we may have to find a bigger swimming pool. But before too much longer they will be big enough to move down to the tank and be on their own. Rouen ducks are identical in coloring to Mallards, but unlike Mallards they cannot fly more than 20 or 30 yards. By the time they grow enough to move to the tank, they will be able to swim into the middle of the water for safety from predators. I still “quack, quack” when I feed them daily in hopes that when they do make the move to the tank, it will only take a few “quacks” to call them up to feed. We’ll see how the transition to the tank goes. The last time we had ducks ready to move to the tank, I walked down to the tank, quacking as I went, with 6 mostly grown ducks behind me. 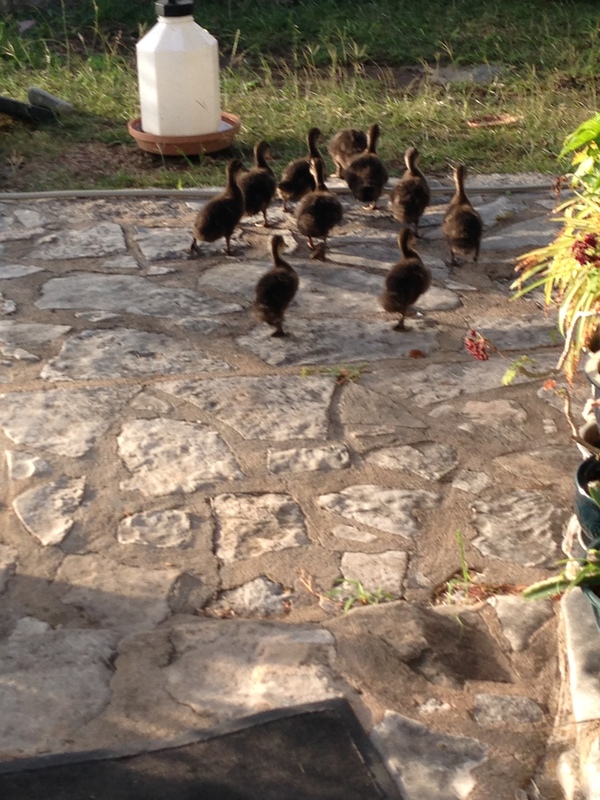 However, I barely got back to the house when we heard them quacking at the back gate. 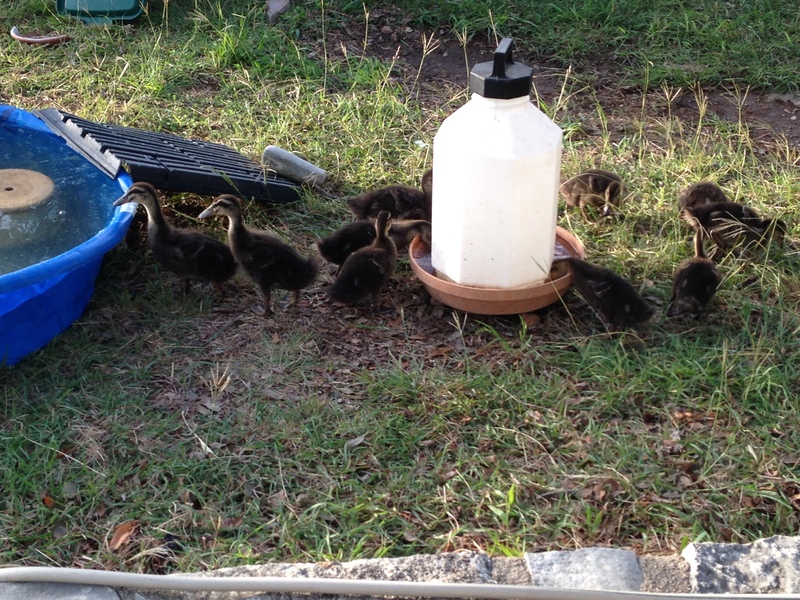 They had not only followed me down to the tank, but evidentially thought Mama Duck wanted them to follow her home. Time will tell about these little quackers..